With the arrival of February, the very cold weather came back to Brussels. Rainy days are gone and its freezing now! Seems that the winter wants to make sure that we don’t forget it yet. In general, I am not really a winter person. But the reason why I still can enjoy this season (after Christmas) is that I can stay home in the evenings, light the candles, make myself some good tea and stay cozy in my sofa reading a book or watching a nice movie (although, I don’t really remember when I did so recently…). 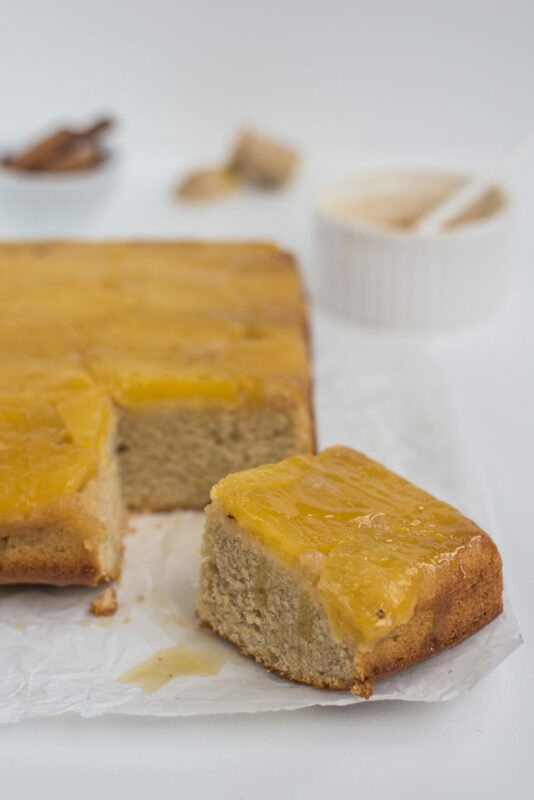 Right now for example, instead of watching a nice movie or reading a book, I am writing this Upside-Down Pineapple Ginger Cake recipe with a cup of white tea, hoping that it will also make you feel warm, as it is spiced and shines with this very yellow color! I am a fan of upside-down cakes and a lover of spiced cakes in general. 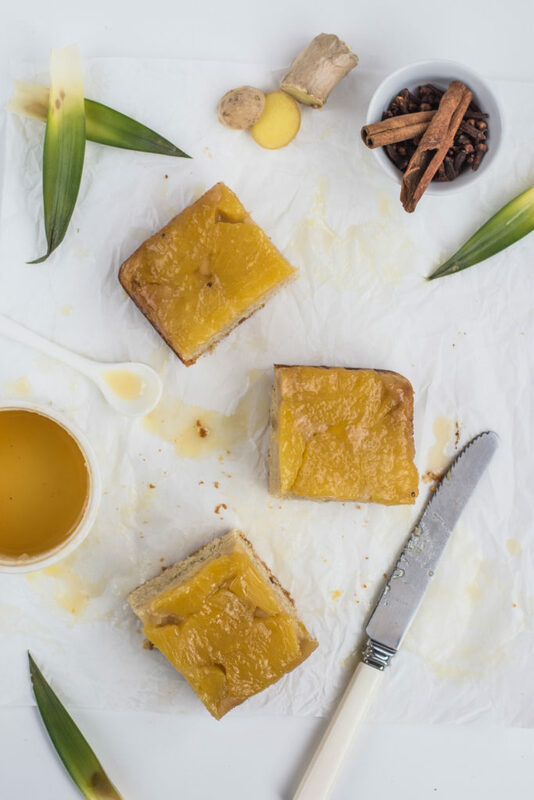 And guess what… This Upside-Down Pineapple Ginger Cake has it both! It has a moist texture thanks to the added cream and smells cinnamon and ginger. It is best when served still warm, so have this in mind when you make it. This recipe is for the brownies pan, but if you don’t have it, then use any round cake pan of smaller size. 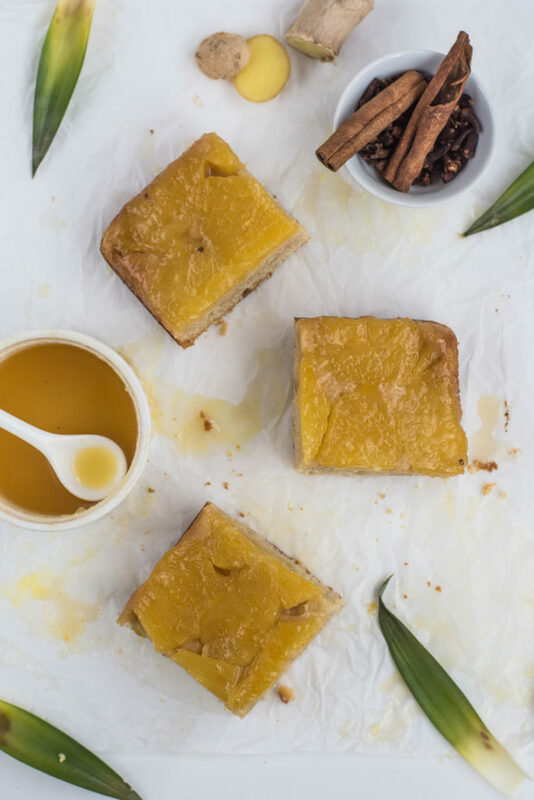 Here you have the recipe and if you make this upside-down pineapple ginger cake, please let me know how it turned out via the below comments! 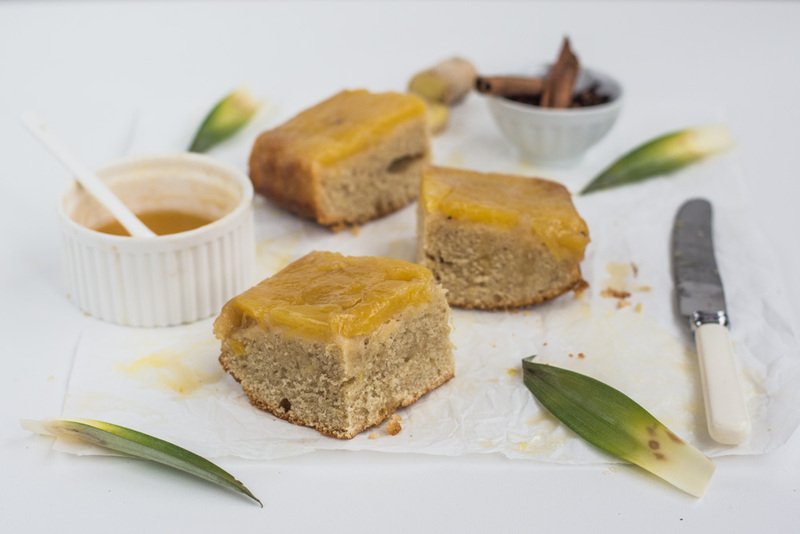 Delicious moist spicy cake with caramelized pineapple and ginger warms you up during the cold winter afternoon! It tastes the best when served warm. Quarter lengthwise the peeled pineapple, core it and keep only 2 quarters. Cut each into 12 slices (about 1-1.5 cm thick). Place 60 g butter and 115 g brown sugar in a large pan over a medium heat. Stir to dissolve the sugar, then bring to boil and add half of the pineapple slices and grated ginger. Lower the heat and cook for 3 minutes, turning each at halftime. Place the pineapple slices on a grid and repeat with the rest of pineapple slices and grated ginger. Reserve the syrup for later. Preheat the oven to 180°C. Grease the brownies pan and line it with a slice of baking paper exceeding the opposite sides of the pan of about 5 cm, then grease again and line it with a second slice of baking paper, exceeding the other two sides of 5 cm, so that you can then easily take the cake out afterwards. Place the pineapple slices in the bottom of the lined pan close to each other and pour two tablespoons of the syrup over. Set aside. In a large bowl, beat 160 g brown sugar with 80 g melted butter until light and fluffy. Whisk in the eggs one by one. Stir in the cream. In another bowl, sift together the flour, baking powder, salt, ground cinnamon, ginger, and clove. Add the flour mix to the butter mixture and stir well until blended. 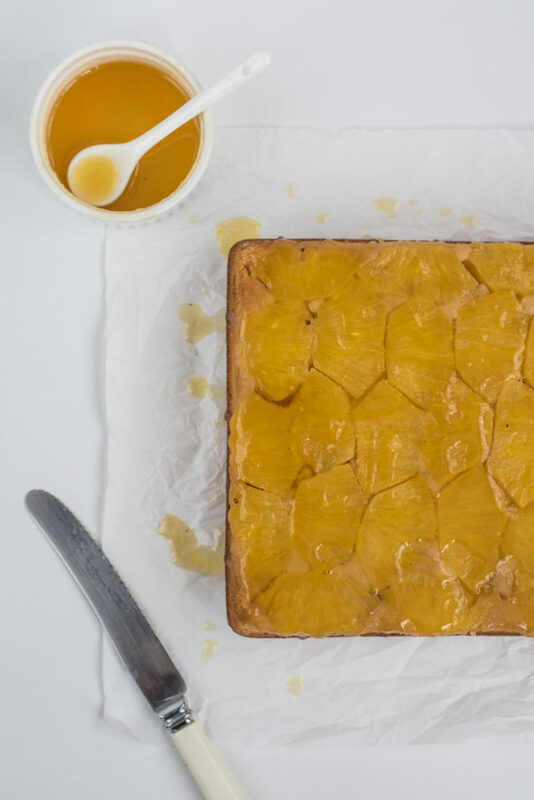 Gently pour the batter over the pineapple slices in the pan and bake in the preheated oven for 45 minutes to 1 hour, or until the toothpick inserted in the center comes out clean. Few minutes before the cake is baked, bring the remaining syrup to boil, lower the heat and cook for 5 minutes until it thickens. Remove the cake from the oven and cool for about 5 minutes in the pan, then place a serving plate at the top of the pan, turn it upside down so that the cake sits on the plate and gently remove the pan. Pour the remaining syrup over it and serve warm. Delicious! Definitely going to give this recipe a go ?